Marilyn Minter, Thigh Gap, 2015, enamel on metal, 72 x 86 1/2". 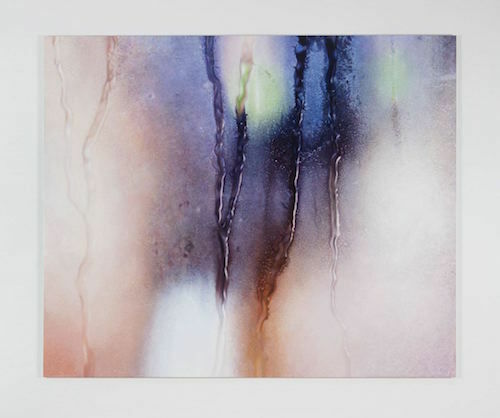 Marilyn Minter is what some would call a “nasty woman”—a term that has made quite a few waves this past election season. And depending on who you are and where you stand, that epithet can either be the highest form of flattery or a scathing misogynistic insult. Minter’s “nasty” work demands respect from its audience, and the large scale of these in-your-face paintings serves to reinforce this idea. The women depicted here—seen through a misty haze, as if in the midst of a scalding-hot shower—stunt the male gaze and its obsession with bodies that are polished, waxed, nipped, tucked, and Photoshopped into oblivion. Minter’s subjects flaunt their untended pubic hair, bare breasts, and luscious lips. Her bathers face the viewer directly. The artist’s palette is hypervivid, and the blurriness caused by the pane of glass that she rephotograhed these ladies through for her paintings render her subjects as impossible fantasies, well out of range for any common boy’s stare. Works such as Big Breath, 2016, and Thigh Gap, 2015, defy centuries of male leering and dictate their own rules of representation. Exhibitions like this one are necessary—Minter’s art is crucial. Women are going to be thrust into plenty of darkness in the coming years, and her pictures remind us that a society cannot call itself free until all women—regardless of their dimensions, sexualities, and ethnicities—have full control over their own bodies.